help winterizing the boats, inventorying supplies, checking sails, and keeping our trailer organized. While it may sound like a lot of work it's also fun, because in addition to keeping our fleet in tip-top shape, you'll have a chance to meet new sailing buddies, learn more about our boats, and swap yarns about the past sailing season. So, when you see a notice in your inbox or in an article in Between the Sheets requesting help, please respond with enthusiasm. 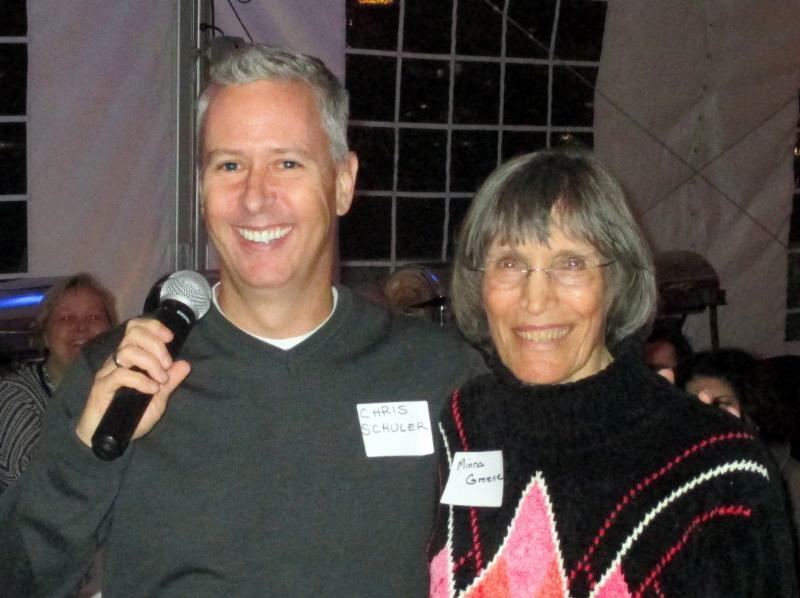 Chairman Chris Schuler joins Minna Greene at last year's celebration. 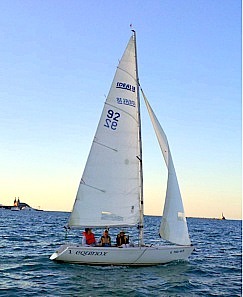 Every year, Sail Chicago ends the sailing season with festivities, food, drinks, and member recognition, and we are thrilled to invite our members, students, and their guests back to Columbia Yacht Club for a second year. Sail Chicago's Season-End Celebration will be Friday, November 17, 2017. Make sure to update your calendar--you won't want to miss this great event! 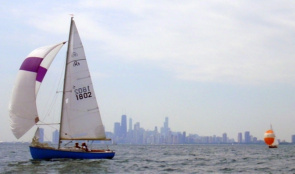 Join us for a buffet dinner, cash bar, and a chance to celebrate a successful sailing season with fellow Sail Chicago members. We will recognize those who have excelled in the organization, either through their achievement or through their volunteer service. $40 in gift cards for Weather Mark Tavern. 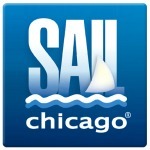 For updates on silent auction items check Sail Chicago's Facebook page. The event is open to members, students, and their guests. The cost is $30 per person and there will be a cash bar. Keep an eye out for further information about how to register. Email Sarah Pellegrino with questions about the event and Rachel Granneman for questions about the silent auction. As the end of the season approaches, I want to thank everyone who participated in service time. It's your hard work that makes this organization run. Jeff Doyle and Raj Uparkar will be contacting team and program leads, as well as some individuals to get your end-of-season reports. These reports need to include what went well with your program and what you could do differently next year to make it more efficient. It's also important to include all members who completed their service time by working with you. Please send in these reports back to them as soon as you are contacted, while all the information is fresh. We will pass your reports onto the board and record service time. In early spring, I plan to indicate on the website which members have satisfied their service time requirements. If you go online to pay your dues next spring and your service time is not shown as satisfied, but you think it should be satisfied, please contact Christine Garvey. We still need a second person to help keep the maintenance trailer organized. And we need a second boatyard coordinator. The boatyard coordinator needs to be at the boatyard to help delegate the work that needs to be done and to document who comes out to help. Please contact Christine Garvey if you are interested. 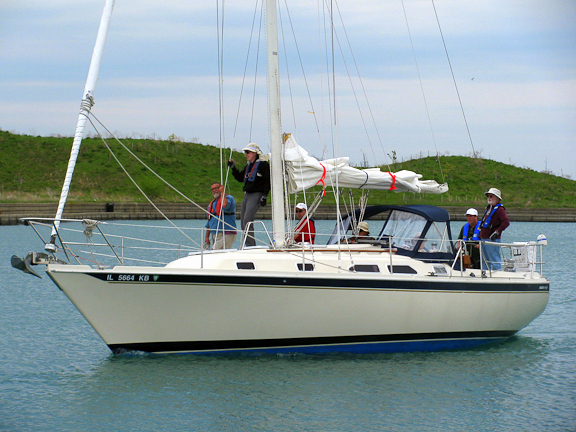 Calypso, our Ericson 34, began its life with Sail Chicago and completed fourBareboat Cruises as well as MCO's, Orientation sessions, and many multi-day rentals. The boat is fast, well laid out, and all crews have been delighted with its performance. Its season ends on October 18 when it heads down river for winter storage. Contact Simeon Stairs if you would like to help. 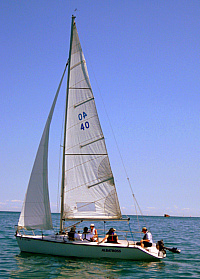 Priorities was used for basic cruising instruction that introduced five classes to the cruising life. Many skippers also continue to use Priorities for private sails. Engine hours were evenly split between the two cruisers, which should ease the use of Priorities. Priorities heads to winter storage on October 11. Contact Norm Linde if you can help. Plans for next year include: a series of winter seminars covering topics of safety at sea, multi-day cruises, weather and coastal navigation; a coastal navigation class in March in preparation for next season's weekend bareboat cruising classes; and an overnight passage making class. Many thanks to the maintenance crews, instructors, MCO crews and skippers, Lawrence Hall crews and skippers, the rusty skipper instructors, and all the students and crew that helped make 2017 a great sailing season. This summer I had the great pleasure of visiting a few of the great seaport cities of Europe and enjoying their maritime museums. In Kiel, Germany, on the Baltic Sea, one can visit a small, but informative museum with some great displays devoted to "Kiel Week" which is the largest sailing festival in the world. Kiel Week takes place every year in the last week of June with over 2,000 boats, many of them tall ships, and over 3 million visitors. 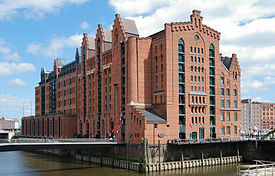 museums called the "International Maritime Museum" in Hamburg. It was started with the private collection of a German shipping magnate and now houses over 40,000 items on 10 floors of an old brick shipping warehouse in Hamburg harbor. The collection starts with a 3,000 year-old dugout canoe found in the River Elbe to displays on the future of seafaring and ocean exploration. All displays are expertly captioned in English and German and definitely make this museum worth a visit. While in Athens, it is difficult to not come across its ancient seafaring history no matter where one goes; unfortunately, the city's main maritime museum was partially closed due to the country's current economic troubles. Chris Schuler will meet with Columbia Yacht Club to work out details of our continuing relationship. Maya Teleki asked each Board member to identify potential new Board members for 2018. Martin Modahl reports that we continue to be in a good financial position. Safety: There were four incidents during the month that resulted in serious damage to our boats. John Lemon will summarize the season's incidents and make recommendations to the Board at the October meeting. Meridian and Recess have been damaged and will motor to Canal Street, ending their season. The remaining Colgates will be pulled on October 14 with October 15 as the rain date. Tom Peterson will resign his Maintenance Management position. Plans for his replacement are being finalized. Social: The 2017 Season End Celebration will be held at the Columbia Yacht Club on November 17. Nominees for the maintenance, instructor and skipper awards are being sought.